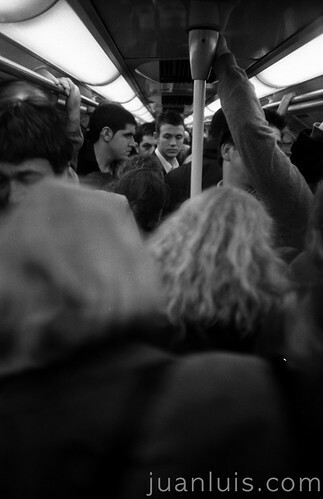 The daily commute or how to keep yourself happy. I have discussed my daily commute before. As it is bloody cold, wet and dark at present, I have ceased my cycling for the moment and am relying on the combination of walking, train and tube again. Every morning when I stand waiting for my train, I marvel at the numbers of commuters cramming every 10 minutes into the train to London. These trains are not little 2 wagon affairs, now, they are appropriately 300 meters long and apparently have about 1000 – 2000 commuters on it. As you can imagine, finding a seat can be very difficult, especially when the trains are late and everybody is trying to cram into the last standing space to be at work on time. When the train pulls in, you quickly have to decide what will be the best way to entertain yourself, depending on the amount of passengers waiting with you and the amount of passengers already on the train. Awkward standing Space: (ca 8 men sharing): Paperback and Music. This necessitates a paperback that can be held and used with only one hand. If you follow these easy guidelines, you too can have an entertaining and educational commute. Just don’t forget to brush your teeth and use a bit of deodorant. For the rest of us. ← The Xperia X1. Useful.